Clothes swapping parties have really taken off recently, with the economic crisis, cheap labour and global warming all issues that the discerning fashionista is becoming increasing aware of. In the UK alone, 900,000 tonnes of shoes and clothes that are thrown away every year! The easiest way to hold a clothes swapping party is in your own home with a group of friends. But websites like Swishing also offer an easy way to organise and advertise on a larger scale. Guests are asked to bring with them any unwanted items of clothing, shoes and accessories in good condition, to swap with other guests. Sometimes attendees are charged a small entrance fee with proceeds going to charity, and any left over items donated to charity also. At Visa Swap, a nationwide campaign, celebrities and designers also donate items. The advantages are that you get to get rid of your unwanted items, and re-stock your wardrobe for free! The parties are also a great way to network and make friends. 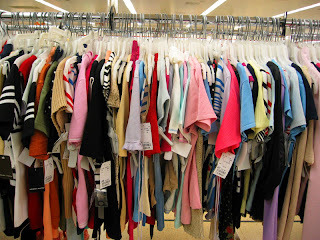 Have any readers been to or organised a clothes swapping party before? They sound like a lot of fun...imagine a huge hijabi fashionista clothes swap? Hmm, sound like an idea ladies? Interesting sis, I had never heard of this before. I live in a smallish community that lacks Islamic stores of any kind, so hijabs and specialty clothes are treasures here. We have had a few "New To You" swaps in homes and recently at a new community space and they are great fun, masha Allah. It's good to do some advance planning-give sisters plenty of time to go through their wardrobes. The first one may be a little small, but they catch on! Funny you should mention this. Here I was thinking I had been so creative to plan a hijab exchange, and everyone's already doing it. I think it would be harder with clothes, so we are starting with just the scarves. I know we all have too many that we don't wear to leave them lying around. I like the small donation idea—maybe we'll ask for $10 each and give it to Islamic Relief. Thanks for spreading such a fun AND sustainable idea!